J. is the studio director and has been teaching for 35 years and has worked with thousands of students. His experience as a teacher and player inspires students to participate in diverse traditions of American popular, classical, world musics. 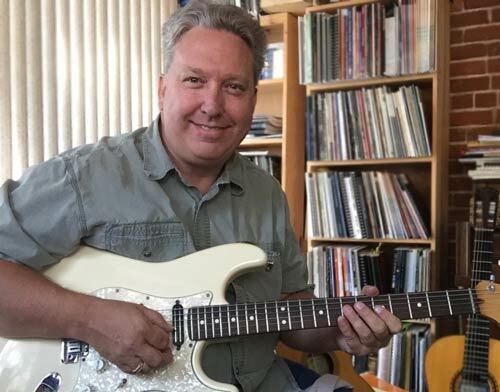 His private and group lessons creatively explore songs, riffs, rhythm parts, bass lines, melodies, and sneak in how to read all forms of notation and strive to understand harmony as it relates to a broad range of popular musical styles including Jazz, Blues, Rock, Funk, Fusion, Country, Folk and Classical. Students are encouraged towards performance, composition, improvisation and make use of the latest in music learning technologies. J. was born on the same date as blues guitarist Stevie Ray Vaughn and got his first guitar when he was a 5 years old. In his first career, he managed a martial arts school in Napa California. That experience formed his positive approach to teaching. J. studied guitar in high school as well majoring in music in college. In 1988 J. began private instruction with Master Guitarist Steve Sage. He studied privately 3 years as well as 8 semesters of The Electric Pop Guitar Class at D.V.C. Was a member of DVC’s Guitarkestra, a nine piece electric guitar orchestra led by Sage. J. attended clinics with such artists as Bruce Forman, Robben Ford, Jennifer Batton, Warren Nunes and others. He began playing in various bands from 1990 to the present. 1992 – 1996 Studied with Jazz Great Warren Nunes – Guitarist, Author, Teacher. Among Nunes’ many books he’s most well known for hisJazz Chord Bible published by Warner Bros.
As an advocate of life-long-learning, J. has been studying music with master musician W. A. Mathieu since 2004. Mathieu is one of the world’s most renowned and influential composers living today. He is also an author and a teacher. His consciousness raising books include: “A Musical Life,” “The Listening Book,” “Harmonic Experience, Tonal Harmony from its natural origins to its modern expression” and, most recently, “Bridge Of Waves” – What music is and how listening to it changes the world. “I try to learn from every thing and every one.” Like guitar-great Tuck Andress, J believes in self-realization and spiritual development through the arts and playing music. A good guitar teacher can open your mind to the fantastic possibilities of the instrument and having a successful, experienced individual who loves teaching and has your best interest at heart is better than any book, video or teacher with less commitment. See for yourself how excellence in instruction creates excellence in YOU. In 2006 J. opened 851 Music Studio, the most innovative place to learn music in the North Bay Area. Grand opening of new location at 1043 Grant St, August 1, 2011. When he’s not teaching lessons, he’s reading, playing, composing, geeking out with a computer or heading out to a beach.